Volcano is one of the most visible e-cig brands in America. The company has several mall kiosks throughout the country and a pair of excellent vapor cafes. The company’s Lavatube line is one of the most popular mods out there. So how are Volcano’s e-liquids? I vaped Bonzai Banana, Lahaina Lychee, and Pipeline Peach to find out. The short version is that I can’t recommend any of these juices. One of them was passable, while the other two didn’t appeal to me at all. Here are the breakdowns and steeping notes. Bonzai Banana: This juice has a very artificial and candy-like taste. My brother likes this one because it reminds him of banana taffy, but I couldn’t stand it. You know how a banana scratch-and-sniff sticker smells? That’s how this e-liquid tastes. Even though I prefer natural fruit flavors, I understand that some people enjoy candy-like e-liquids. That said, I honestly don’t see the appeal of this particular take on banana and think that my brother is a bit nuts for liking it (though to be fair, he’s only been vaping since December and hasn’t tried many “good” juices). 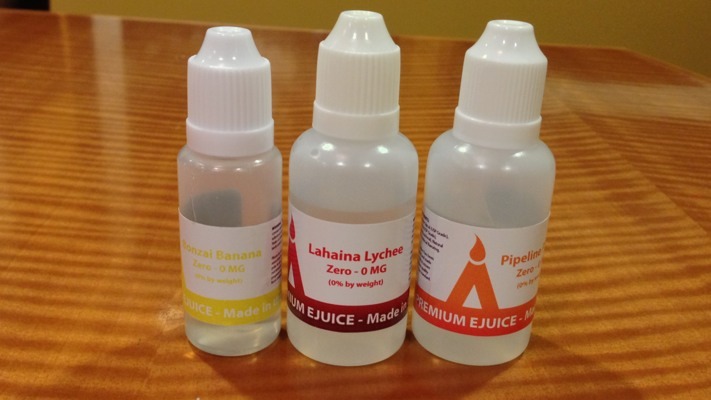 Lahaina Lychee: I was really looking forward to this one because lychee is an uncommon e-liquid and most popular vendors don’t offer this flavor. I absolutely love the fruit — both fresh and canned. This juice has a mild lychee taste, but it’s also accompanied by some bitterness and a pungent aroma. Additionally, it doesn’t have the sweetness I expect from lychee. While it wasn’t as bad as its banana brother, I thought that this juice was mediocre at best — the lychee flavor wasn’t strong enough and too many other characteristics spoil the overall taste. I have a bottle of Ahlusion’s Boba Tea with Lychee that I’ll be reviewing in the future; the lychee flavor in Ahlusion’s juice is exponentially better than the one in Volcano’s. Pipeline Peach: This is a pretty average peach juice with a candy flavor. It reminded me of Haribo Gummi Peaches. Again, I prefer natural fruit flavors — especially when it comes to peach — but I can see how some people would like this juice. That said, it’s pretty average. If you’re looking for a candied peach taste then I recommend Backwoods Brew’s Peach; it’s much better and a little bit cheaper than Volcano’s juice. While this juice was “pretty average,” as I mentioned earlier, that also makes it the best of the three. On the advice of Wlad from Ahlusion, I’ve been trying a new steeping method starting December 27, 2012. When the e-liquids arrive, I leave them uncapped for five minutes. Previously, I left them uncapped for about two days. After the liquids are given a few minutes to oxidize, the caps are put back on. The bottles are shaken every day for at least two weeks before vaping. RPad.TV e-liquid reviews focus on the flavor of the e-liquids, since throat hit and vapor production can be altered by the PG/VG ratio and nicotine level selected. Each juice is vaped over a period of days in an atomizer, a cartomizer/tank setup, and a clearomizer. The exception is naturally-extracted tobacco (NET) juices; since those are known to clog up cartomizers quickly, those are vaped in atomizers and clearomizers.